Have you tried the new pop tarts? One is peanut butter and the other is peanut butter with chocolate frosting. So far I have only tried the peanut butter with chocolate frosting. To me it tastes like a peanut butter smores. Or even better, a graham cracker with a melted Reese’s cup on it. The only problem I find is that I’m full after eating one and have to put the other one in a baggie for later. Maybe that’s a good thing. It’s more like a snack you have to be in the mood for, rather than a pop tart you would be used to eating in the morning. My preferred pop tart would be the strawberry filled without the frosting. 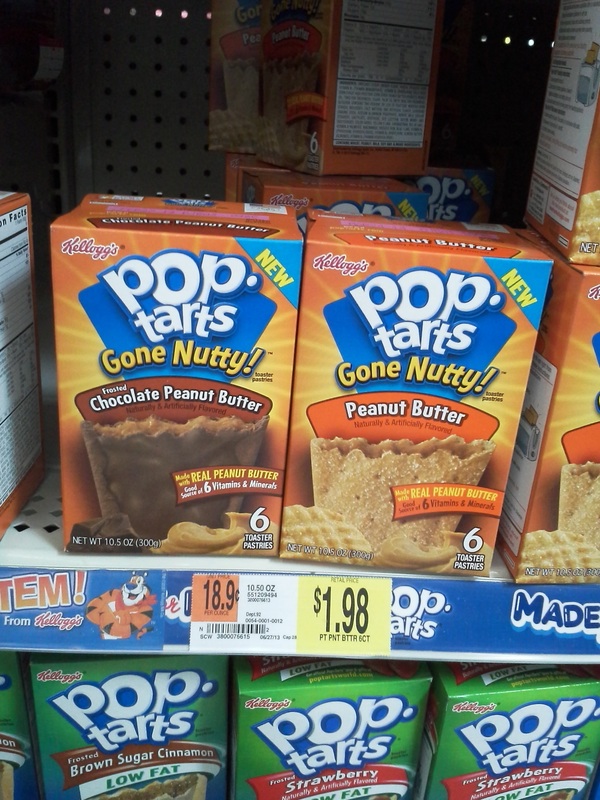 This entry was posted in Blog and tagged new pop tarts, peanut butter, pop tarts, Reese's cup, smores on August 22, 2013 by JenniferNAdams. That looks kinda interesting. I prefer the strawberry myself. Yes they are too sweet. Hmmmm….two of my favorite flavors…peanut butter and chocolate. I feel a trip to the store coming on. My daughter loves poptarts and peanut butter cups, so this is something we are going to have to try!